July 15, 2008 - We arrived at Skagway Broadway Pier at about 6:00 a.m. The port can handle 5 cruise ships and up to 2,000 visitors at a time. While on board we met our tour guide, Dustin, who would be with us for the next 6 days. This was our last day on the cruise ship. Our first tour was with Rosie and Valarie, both in period costume. Rosie was definitely the actress and was always looking for smiles as she told stories related to the town and its characters. We boarded a yellow, 1927 sightseeing motorcar and traveled around the waterfront, along the boardwalks of the downtown Historic District, and up to the scenic overlook for a panoramic view of the town, the ship, and surrounding glaciers and peaks. There was a visit to the Gold Rush Cemetery where we heard stories about the settlers buried there. One of the stories was recounting the famous Soapy Smith gunfight. We were inducted into the Arctic Brotherhood, and watched a command performance at the Club House Theater. We saw The Skagway Story highlighting the history of this gold rush town and the pioneer families that built it. At 12:30 p.m. we boarded the White Pass & Yukon Route Railroad for about a 3 hour trip to Fraser, B.C. 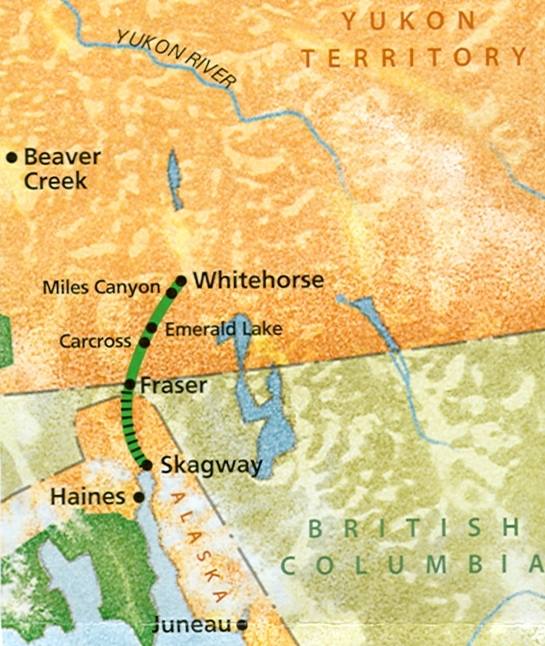 This was the most heavily traveled route to the Yukon gold fields during the 1898 Klondike Gold Rush. Canadian customs official met us at Fraser. Bus driver was DJ. He would be with us for the next 2 days driving us to Dawson city. The drive to Whitehorse was on the Klondike Highway. We stopped in Carcross for a short break. Kirsten and I walked around the town in a light drizzle. We had our passports stamped at the local post office.